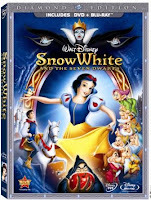 The DVD/Blu-ray package of Snow White and the Seven Dwarfs: Diamond Edition hit the store shelves on October 6th, 2009. The single DVD version will not be available until November 24th, but still in plenty of time for the holidays. I was so excited to be able to share this film with my children for the first time. The twins have had Grumpy and Dopey plush dolls since they were born. They finally had a chance to see them come to life. Here is one of my favorite scenes from this Disney film. 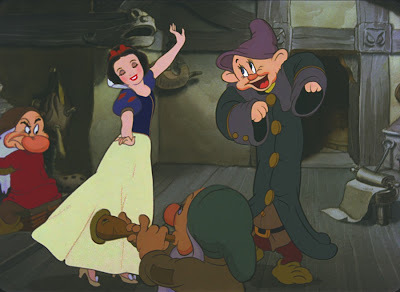 It is the one where the seven dwarfs first met Snow White and where she began to win their hearts . . .
1) I was not sure if our oldest son, who is almost 6, truly understood the beginning of the movie with the Mirror and the Queen. I did need to explain to him the themes of vanity and jealousy, so that he could understand the reasons behind the queen's actions and why they were wrong. 2) Dopey was definitely my oldest son's favorite character. His innocent face, big ears, oversized attire, and knack for physical comedy makes him difficult to resists for most people. 3) One character all my children loved was the slow-moving turtle (or was it a tortoise?) who always arrived at its destination one second too late. Its arduous task of climbing up the stairs was just as memorable as its tumbling back down them. 4) A lesson that was clearly illustrated for my oldest was to never tell a stranger that you are home alone. Just think how Snow White's story would have differed if she had been a little more street smart. 5) The bonus feature, which showed the first six minutes of "The Princess and the Frog", really did a great job of showing my son how a Disney film looks before it is completed. He was truly amazed and never thought of an animated film as works of art that developed in stages. You should be able to find Walt Disney's Snow White and the Seven Dwarfs: Diamond Edition at the Disney Store or at other local and online retailers of Disney films. Thank you to Click-Communications and WDSHE for providing us with a review product free of charge.